Rear monoshock with adjustable preload. Who calls a motorbike a Van-Van? Especially in 2003? And, more to the point, why? Well, if you are Suzuki's marketing team, the answer is very simple. Suzuki call their cute little RV125 a Van-Van because they had one in their range in the dark ages, it was popular and it seemed like a good idea to resurrect it. So they did. 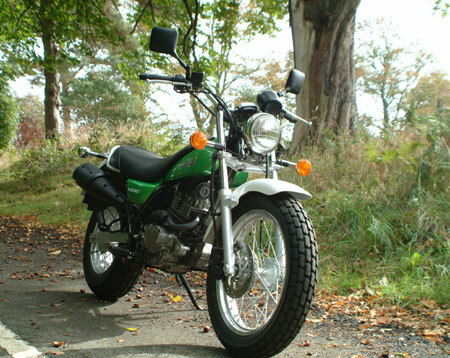 To be fair, the new bike does bear more than a passing resemblance to its antediluvian predecessor. The big chrome headlight, spoked wheels, single front disc with a drum on the back, the elderly air cooled single cylinder engine and the retro styling all hark back to a gentler age of motorcycling. Actually that isn't entirely true. The age of motorcycling that they invoke memories from wasn't gentle at all. 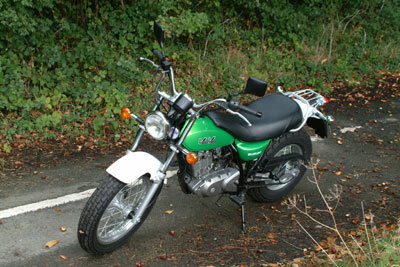 It was full of evil handling semi reliable overpowered and underbraked animals of motorbikes. And a few gentle souls, which died out as more and more people were converted to the dark side of multi-cylinder high performance biking. But they do say that what goes around, comes around. And that's certainly the case here, where there seems to be an increasing demand for a commuter bike that isn't a scooter but isn't a missile either. Plenty of people still have sufficient prejudice against scooters that they need something with big wheels, but at the same time they have a sufficiently realistic view of their abilities to limit the performance available to them. The bombsites that masquerade as road surfaces in our cities mean that a commuter needs pretty plush suspension, while the occasional need to go up the kerb to reach that last parking bay means that big balloon tyres will be a major plus. The seat needs to be large enough to handle a full size bottom and there needs to be some luggage capacity. Step forward, then, the Suzuki RV125 Van-Van. First impressions are of something that is distinctly different in a conventional kind of way. It looks unusual enough to stand out but at the same time it isn't so radical that the target audience will stay away from it. It is also very small, although once on board it is surprisingly spacious. So something of a rolling contradiction, then. Starting is a quaint return to The Good Old Days as the manual choke (on the carb, under the tank) needs to be pulled out before the engine will fire from cold. Oh, and of course you need to turn the fuel on as well. Ancient rituals aside, the bike starts and ticks over as cleanly as you would expect. 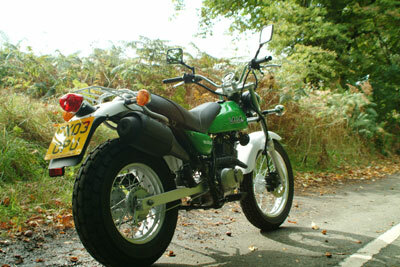 The 125cc single doesn't really vibrate at all and the noise is pleasantly muted. Controls are light as anything, and the gearbox is smooth enough although not as typically Suzuki slick as we have come to expect on test bikes from Crawley. Pulling away is simple as there is a surprising amount of torque and the clutch is delicate and sensitive. Acceleration is, um, slightly lethargic when compared to the SV1000 that I swapped for it but perfectly respectable when taken in context. That said, you are unlikely to out-drag many things quicker than a well driven milk float at the traffic light grand prix. Braking is similarly adequate, with the single front disc hauling the Van-Van down in a respectable but totally undramatic manner. Stoppies are not, you may be relieved to hear, part of the equation. Out in the open the Van-Van goes perfectly well enough and is able to haul itself and my thirteen stone along at or around the legal limit without fuss. In fact, given the space, the Van-Van will build up to a quite respectable speed and will hold it for as long as your mechanical sympathy allows. It sounds a little strained at high speed, which is hardly surprising, but seems to suffer no ill effects from such sustained abuse. Handling is remarkably good although there is an inevitable penalty to be paid for those big balloon tyres when it comes to accuracy of lines. There is a distinctly soggy feel to the whole plot on faster bends, but nothing untoward ever happens and the overall impression I was left with is of a very safe bike. It also generated a surprising amount of grins during a spirited, but still rather slower than I am used to, cross country jaunt. Despite the pseudo offroad styling, I suspect that city streets are actually the Van-Van's natural home, and to test this theory we went shopping. Well, we went into London, anyway. I don't do shopping as a rule. The Van-Van was brilliant. The previously slightly soggy suspension proved perfect for soaking up those London potholes while the big tyres made accessing bike parks across kerbs child's play. The brakes were fine, the mirrors are great and even the lacklustre performance wasn't really a problem. I was surprised by the Van-Van. Not least because I liked it. It feels a bit like throwback to the early eighties in terms of handling and braking, but for a bike like this that isn't necessarily a bad thing. It's comfortable, it performs adequately, it's unthreatening and it's a really great way of getting around in town. Even better news is that in the time I had it on test I didn't need to put any fuel in the tank. Can I insure this bike? Copyright © Motorbikestoday.com 2003. All rights reserved. Users may download and print extracts of content from this website for their own personal and non-commercial use only. Republication or redistribution of content, including by framing or similar means, is expressly prohibited without the prior written consent of Motorbikestoday.